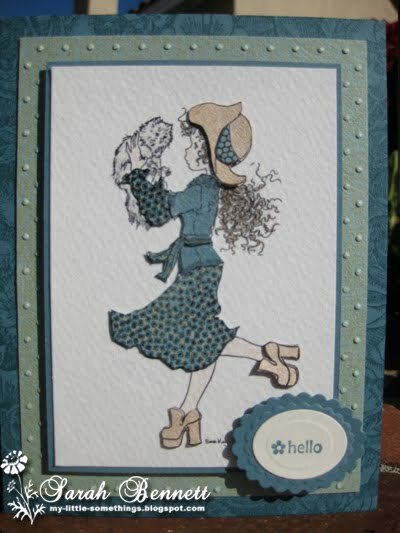 Well, today I have a card to share with you stamped with a really fun stamp from the Stampavie line by Sarah Kay called "Josephine Cuddling Her Pet Cat Nikki". This stamp- along with all of the Stampavie stamps are now 20% off through April 28th at ABC Toys & Crafts! 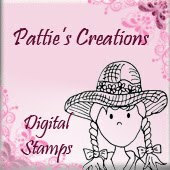 I loved using this stamp! The image is just darling and it has so much detail. I decided to do a combination of things with it: I both water colored it using watercolor crayons and watercolor pencils, and I also did some paper piecing for her outfit, shoes and hat. The paper is from the K & Company "Bailey" designer Mat Pad. I hope you will check out all the wonderful Stampavie stamps on sale now- there are so many great one from which to choose! And don't forget, there's still a little time to play along in our "Anything Goes" challenge! And for the "twist", you must have a sentiment (on the front of your card, as always) that lets the person who will receive it know you are thinking of him or her. 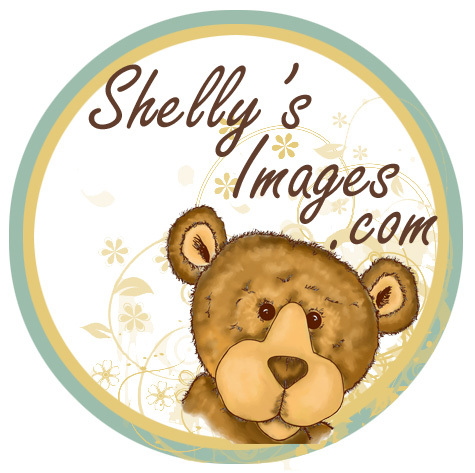 Our sponsor this week is Stitchy Bear Digital Stamps, and will be awarding the winner of our challenge a $10.00 gift certificate! Thanks so much for visiting today. I hope you'll leave me a comment. I always love hearing from you! Good Morning and Happy Sunday! Can you believe its the middle of April already? 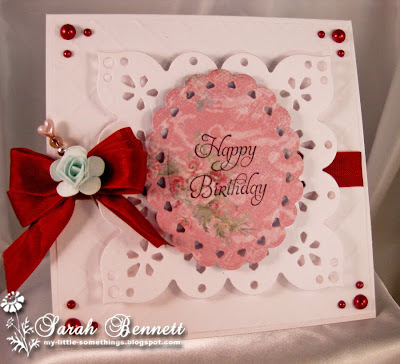 And that means that over at Scrap Your Crap there is a fun new challenge starting today.... Paper only!!! 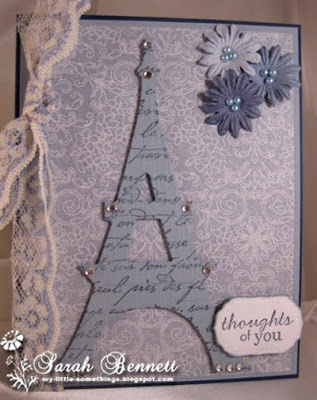 I hope you will join us and make a "Paper Only" card, scrapbook page or other project of your own and share it with us. Just click the link and check out Scrap Your Crap for all the details and to see all the wonderful examples from the entire design team! The paper is from a Basic Grey. I love the colors and pattern and felt it was great for a birthday celebration. The colors of the Stampin' Up! card stock papers I chose match really well. The Spellbinders Labels 9 dies were a great fit for the sentiment. I had a lot of fun making this bird. After die cutting it out of chipboard, I painted all the sides with an Adirondack dabber in Sandal color. 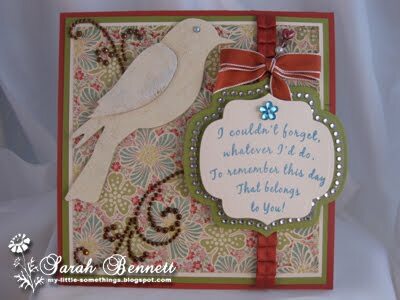 Once dry, I covered it with matching die cut pieces in a coordinating pattern from the same Basic Grey paper collection. Then I added a little blue pearl for the eye. I wasn't too sure how to tie the pleated ribbon, so I put a strip of it down and then added a bow made out of taffeta in the same color. I made a little stick pin to put down through it. I think it added a nice soft touch over all the bling around the sentiment. Thanks for stopping by today. I hope you'll consider leaving me a comment, as I always love reading them! Sentiment stamp from Crafty Secrets clear stamp set "Card Sentiments"
I used chipboard for the bird cage and painted it with the Adirondak Matallics paint dabber in Pearl (also from eP). And the bird and wing was cut out three times- once with chip board and then again with Cameo Coral c/s and again with lace fabric. I attached the lace by brushing Mod Podge on the c/s covered bird and using it like glue- and then brushing a little more right over the lace. I added a tiny pearl for the bird's eye. Isn't she pretty? 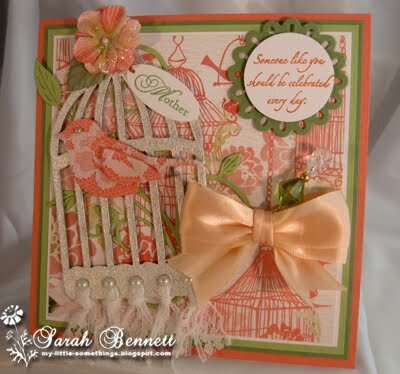 Behind the cage is a flourish die cut and hanging from the cage's bottom is lace ribbon. Then I added some bigger pearls. So be sure to head on over the The Perfect Sentiment Challenge Blog for all the details on our Mother's Day Color Story challenge. Our sponsor this week is Shelly's Images and the prize will be one free digital image. Wow- it's Thursday already! This week has just been flying by for me- how about you? The days are passing so quickly and with so much going on (we all live such busy lives, don't we?) it's sometimes difficult to get in as much crafting time as we'd like. So the card I have for you today is kind of a quick one. Well, it was for me because it's sort of a "left-over-put-together" (did I create a new term, lol?) from a card I shared with you a couple of weeks ago. When making my other card (HERE), I tried a few different patterns for my paper-pieced bustier, and I just couldn't toss out this extra pretty blue one. 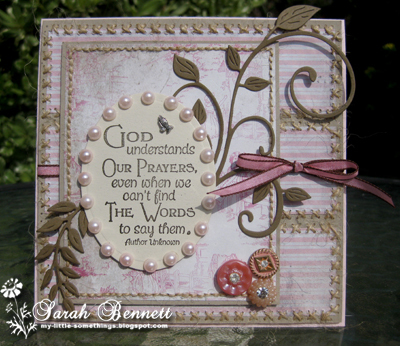 It was made using the Crafty Secrets Sew Special stamp set which is a real favorite of mine- so fun to work with! Anyway, I looked in my stash of die cuts and I found this awesome one I had made in a color that didn't work right for my project at the time. 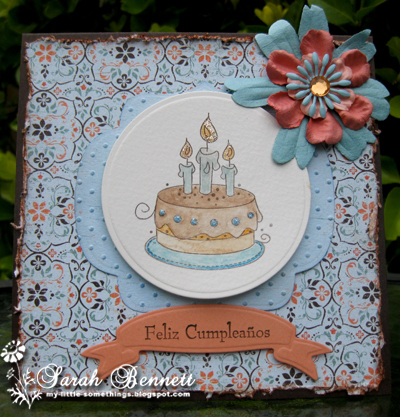 It was cut from one of the Spellbinders Fancy Tags Two die cuts-which are just gorgeous! I put some matching Want 2 Scrap pearls around it and paired the two of them with some gorgeous paper from the Authentique 6x6 "Journey" paper pack (actually the same pack as the paper used for the bustier). I layered it onto a SU! Pacific Point card stock base and that was pretty much all it took to put this pretty little card together! I purposely did not put any sentiment on it so I could have it on hand for different possible occasions that might arise: a birthday, a thinking of you, even a fun bridal shower. So even when your days are busy, chances are you can toss together a hand made card like the one I did today. It doesn't always take a huge, time consuming project to make a nice card for someone special! And don't forget to join in on the fun of our ABC Toys & Crafts DT "Anything Goes" Challenge going on now! Wishing you many blessings during this Holy Week. I hope you and your loved ones have a very happy Easter! 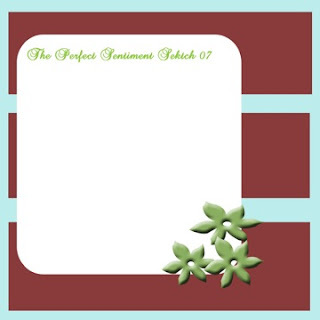 After a little leave of absence from The Perfect Sentiment's Challenge Blog, I am back. And just in time for a wonderful challenge: Easter Bling! The detail in the cross is awesome, and I had a pretty glittered Prima flower for the center. I chose to use purple (a perfect Easter color) "baby bling" pearls for my challenge "bling". I love the size of these, as they are great to put around the Spellbinders scalloped circles and ovals. 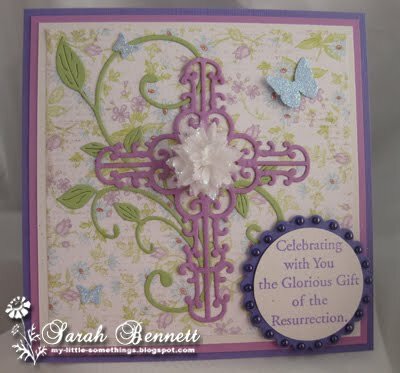 I hope you will join us at The Perfect Sentiment for this fun challenge of using "bling" (pearls or rhinestones) on your card with an Easter sentiment. 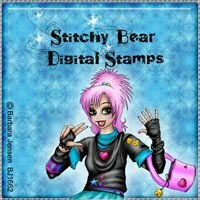 Our sponsor this week is Robyn's Fetish Digital Stamps and More and they will be awarding our winner with a prize of five digital images! Well, today may be April 1st, but this is no April Fool's joke: It's time again for the ABC DT challenge! Yep- already ;-) So get your creative juices flowing because this month's challenge is sure to be a lot of fun since it is.... Anything Goes!!!! That's right- you can create a card or project with a theme of whatever you want! I wish you could see it up close in person, because there is a lot of dry embossing texture on it (maybe if you click on the photo to enlarge, you'll be able to see). Anyway, I love white on white with a splash of color, and the pretty paper from the Crafty Secrets Pastel paper pad provided exactly the amount of pattern and color I wanted. I hope you will join us over at the ABC Toys & Crafts Blog for another awesome challenge. I can hardly wait to see what you come up with! Thanks so much for stopping by today. I'd love it if you left me a comment to tell me what you think of my birthday card. Wishing you many blessings and a happy start to April!